Aimtec launched the new AMSRL-Z switching regulator, an ultra-low-profile open frame non-isolated DC-DC converter. The dimensions of AMSRL-Z series are of 19.5 x 11.8 x 5mm which is extremely compact for this class. 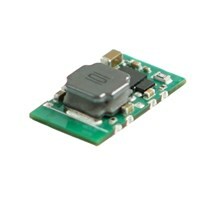 Furthermore, the AMSRL-Z provides an ultra-wide input voltage range of 9 - 72V in a convenient SMD package. This series eliminates the need of a heat sink having an operating temperature range of -40 to +105°C. This series also delivers an efficiency up to 92%, has low stand-by power consumption and short-circuit protection. These models can be widely used for applications in industrial control, instrumentation industries, various IoT applications and many more!